shmolex: This is from a recent game of mine. What is black's best response to ? HermanHiddema: It is important to realize in this situation that black has no targets for attack. All white's groups are completely alive. Black should therefore play for territory. In the game, it went like this. I know that there is a better result than this as I felt like I really got the short end of the stick in the exchange. This doesn't seem so bad. Black now has sente and can play a big move like a, which prevents his bottom group from being attacked while reducing white. It isn't directly sente, but b is a big followup for both players. Black should also keep the moves at c and d in mind to attack the three white stones at the bottom later. IanDavis: as a 3kyu I also think 1 is a must, a hane at A for instance seems to be the kind of thing White would want. JoonasTyystjarvi: if , white gets a fairly big corner by playing B.
Alex: Joonas is right. loses the corner. I like the hane in the original diagram, but not the connection that follows. HermanHiddema: Black can make some points this way while keeping the aji of the moves a and b. Note that playing one to the left doesn't remove the aji at b, it merely turns it into ko. Alex: The hane at seems good to me, since White might not answer if it is made later. After that, though, Black really must come back and defend inside somehow (though not at , since it doesn't help Black break out to the centre). Having to come back to add a move at is painful, however, and shows why answering with is not as efficient as Black probably thought at the time - it would have been better to just answer at in the first place. White probably has better things to do than capturing one stone with , but just to illustrate why Black doesn't have to (and therefore shouldn't) defend there: If White does capture one stone, Black gets to force twice with and , then connect with and have both access to the centre and one and a half eyes on the edge. White's ponnuki isn't that great, because it faces a territorial position in the lower right, although it does of course aim at the aji of a.
zinger: If black plays , on top looks better: it threatens a, and works with white's budding center position. zinger: What about this idea? Velobici: Before choosing a direction of play, evaluating the whole board position seems to be in order. Black's groups appear to be alive or able to make life. Black claims, say, 18 points in the upper right, 15 in the lower right, a couple on the left, a couple in the upper left: perhaps 40 total. White's groups are alive. White claims, say, 27 points on the right, 12 points on the top, 15 points on the left: perhaps 54 + komi total. Black needs to make up some 20 points or more beyond what ever points White gains. Ouch. Gotta choose a direction of play that prevents White from gaining in the center and the lower left and picks up 20 points. One way might be to swallow and the area around it for 12+ points in sente and use threats to save the marked Black stones to take some portion of the lower left in sente, then begin a sweep of sente endgame moves (some indicated by letters). Thoughts? Is this line of play completely off base? zinger: I would count it a bit different - I would give black 45 points on the board, and white 50, plus komi, for a 10+ point lead. In addition, white has potential to expand the center and right, while black has no potential. Last, the black group in the top left isn't absolutely secure - if white plays d, it has only one eye, and its shape in the center is shaky. In short, I agree, black is in trouble. Your plan sounds good in words, but I don't think there really is a sequence for black to "swallow and the area around it in sente". From an absolute standpoint, the correct move for black is probably to resign. But there still may be chances - opponents do make mistakes. 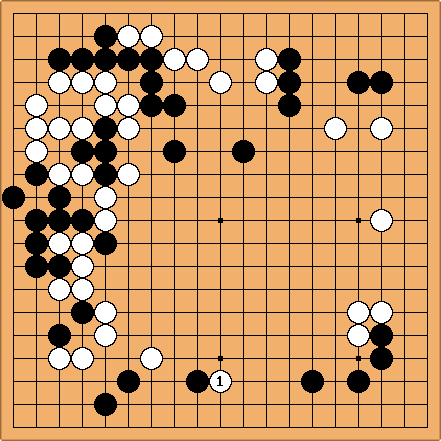 Perhaps black can try something desperate, like a deep invasion of the right side using e, f, and g. It shouldn't work, but if the game is hopeless anyway, what is there to lose? I think that following the principle 1-2-3 a simple sagari is a little bit better. Charles Matthews Yes, interesting: try to make Black a work by means of miai to connect, above and below. If Black is really behind in territory, perhaps the game is lost if you play ordinary moves. Alex: I agree. I like this the best of the suggestions made so far. Although White is unquestionably ahead, playing like this does allow Black several possibilities to create an upset. There is the aji in the lower left, the desperate invasion Holligor suggests on the right, and, having played the sagari instead of the hane strengthens White less, so there is some chance to push and cut at b. Maybe play on for another couple dozen moves before deciding whether to resign or not. zinger: Besides that, white will probably play b immediately, so black will have sente to try deal with the center. Looks like a game, but I'd still rather be white. AJP: I disgree. The situation is not nearly as desperate for black as people are making out. Let's remember that this is an 8K game and there will still be lots of opportunities to swing the game one way or the other. Nevertheless, black is behind. Black should show some fighting spirit! Complications are black's friend. After , I suggest here. Black threatens to take the entire lower side. In particular, since black has tremendous power facing from the bottom right, it seems only natural to herd in this direction. Since is weak, the stones won't have any trouble finding a small life in gote if it comes to that. More importantly, the attack of on is a dual purpose move. Black's real purpose here is to use as a ladder breaker to support black's attack on the right side by attaching at a. Whichever point white does not play in response, black takes the other (if white hanes, black crosscuts, which is even better). Maybe with perfect defense, white isn't in serious jeopardy on the right, but in an 8K game, this should give black lots of quality chances.